QuoteIt4Me is a powerful online quoting tool designed for use by individuals and small teams. Quickly create secure, consistent, professional quotes for complex machines and components! FAST! Create a full quote in under a minute! EASY! Adding your catalog items is as simple as filling out 5 fields. Drag & drop your product photos and they are automatically resized! Need help converting your existing quote templates to QuoteIt4Me (from Word, Excel, etc.)? Choose our "DoIt4Me" service and we'll load them for you! SECURE! Quotes are assigned a unique Quote ID and compiled into secure PDF files which are archived in your quotes list for safe-keeping and organization. QuoteIt4Me is designed to help you produce more accurate, consistent, repeatable, professional-looking quotes! CLEAN! Everything you need and nothing you don't! A Live Quote Preview lets you see (at any point in the quoting process) how your finished quote will look! Totallers, summaries and previews are always at your fingertips. A Quote Progress Bar lets you see at a glance if you've missed any steps. CONVENIENT! 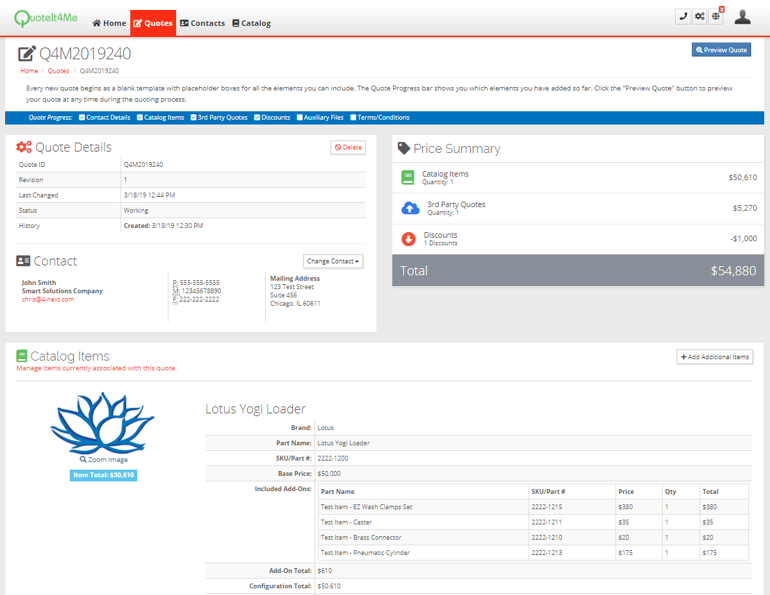 Powerful contacts management system gives you an easy way to keep track of your customers. 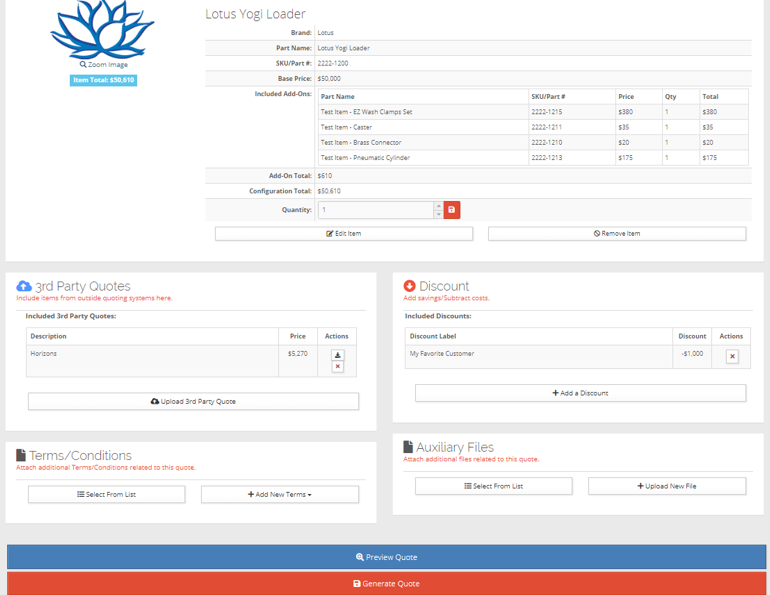 The Quote History page for each customer displays all the quotes you have created for each customer over time. COMPATIBLE! Take your quoting on the road! Optimized for viewing and interaction on desktop, tablets and phones! Plus QuoteIt4Me is compatible with other quoting systems: use the 3rd Party Quote function to embed a quote from an external system right into your QuoteIt4Me quote! Combine the totals and deliver one, clean quote PDF to your customer. UNIFYING! Great for small groups; QuoteIt4Me lets you share catalog items with up to 20 co-workers so you can all quote the same thing! Just click a button to invite colleagues; and then your selected catalog items will appear in their catalog too - ready for quoting! RISK-FREE! 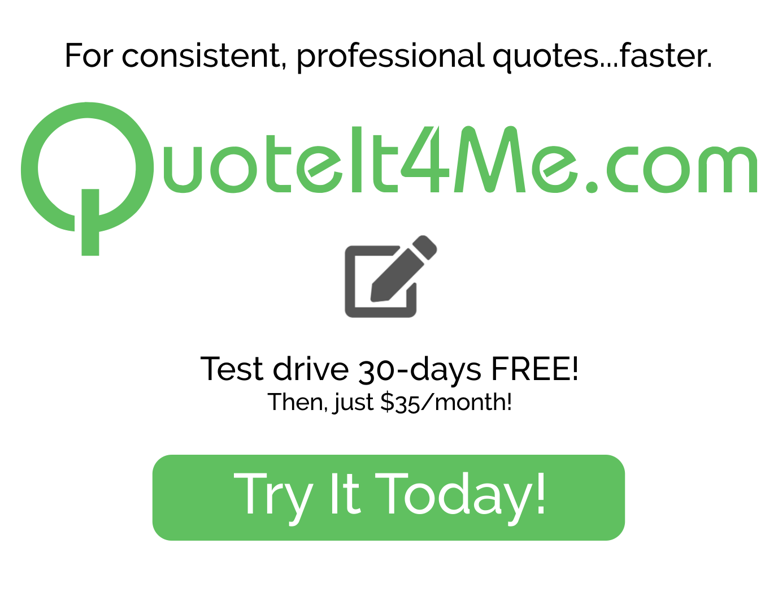 Try QuoteIt4Me FREE for 30-days - no obligation!